What is the basis for feed-in-tariffs for renewable energy in Japan? In November 2009 Japan’s Government enacted a feed-in-tariff for residential and business users, requiring electricity utilities to purchase excess solar power from these users. On July 1, 2012 a new feed-in-tariff system started, based on the 'Special Measures Concerning Renewable Energy Electric Procurement by Operators of Electric Utilities Law'. This law provides that under certain conditions, regional electricity operators are required to connect renewable energy generation facilities to their grids, and purchase the generated renewable energy at feed-in-tariffs (FITs) determined by this law. Once approved, the feed-in-tariff is fixed for a period of 10 to 20 years depending on the type of energy. For solar power plants larger than 10 kWatts and approved before March 31, 2013, the feed-in-tariff rate is 40 yen/kWh + sales tax (currently 5%), so the effective feed-in-tariff is 42 yen/kWh. For projects approved on or after April 1, 2013, the feed-in-tariff rate was lowered to 36 yen/kWh without tax (37.8 yen/kWh including tax). Feed-in-tariffs are continuously reviewed by the Japanese Ministry for Economics and Industry (METI) in consultation with advisory committees to optimize the programs. We expect solar FIT to be reduced in line with falling costs, however other FIT, e.g. for off-shore wind, or for geo-thermal energy might be increased in the future to adjust for the best possible development of renewable energy in Japan. Solar power Japan: Which permissions are necessary to build and operate a solar plant in Japan under the feed-in-tariff? It is necessary to acquire the land, lease the land, or to reach another suitable agreement with the land owner, which permits the operation of a solar plant. To obtain the approval for sale of electricity at feed-in-tariff rates to the electricity utility, it is necessary to obtain an approval from the Ministry of Economy and Industry (METI), and to obtain the connection approval from the local electricity utility. There are fees for these approvals, which must be paid. In addition, permissions by local authorities and other authorities may be required if a change of land zoning is required, or if changes to the land is required such as cutting down trees, or reshaping the land. In some cases other permissions may also be necessary. Solar power Japan: In addition to feed-in-tariffs, are there other tax advantages or subsidies? Yes there are tax advantages, there may be local subsidies, and there are advantages in terms of writing off the investments. 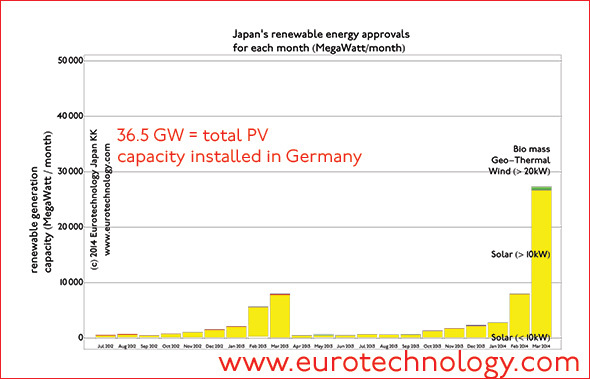 Solar power Japan: Can non-Japanese persons, companies or funds acquire and operate solar electricity plants in Japan? Yes, 100% foreign ownership is possible, however registration with the Bank of Japan under the Foreign Currency control act is necessary. There is no discrimination against foreign ownership. However, there is not preferential treatment either for foreign companies or individuals. You will find that most people on the ground, land owners, project owners, local authors, electricity operator officials speak exclusively Japanese, and all paperwork, official and non-official documents are exclusively in Japanese language, and all your correspondence and submissions and applications will also need to be exclusively in Japanese language. You will need to conform not only with Japanese rules and regulations, but also with Japanese business customs to be successful. Solar power Japan: How easy is it for foreign people or foreign companies to purchase and build a solar plant in Japan? Are foreign or Japanese owners of solar plants treated in the same way? Apart from the notification to the Bank of Japan of the foreign investment, the treatment of foreign or Japanese people or companies will be exactly the same. There is no discrimination against foreign individuals or companies – but there is no preferential treatment either. However, this means also that in all cases all correspondence and all discussions with land owners and their agents and representatives, local, regional authorities, electricity operators and the Ministry of Economics and Industry (METI) are all in Japanese language, all documents are in Japanese language. So if you do not speak or read and write Japanese, you will need to partner with Japanese people or companies, or hire Japanese employees, or local companies who can. Comments and disclaimer: This information is provided to the best of our knowledge, but we do not accept any responsibility for errors. This information is not legal or financial advice. For legal or investment advice we recommend that you consult a licensed Japanese lawyer or licensed investment advisor.